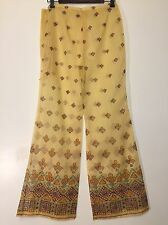 For your consideration, a pair of sheer bell bottom pants from the 1970's. Yellow with a colorful ethnic pattern. Very minor wear from normal use.